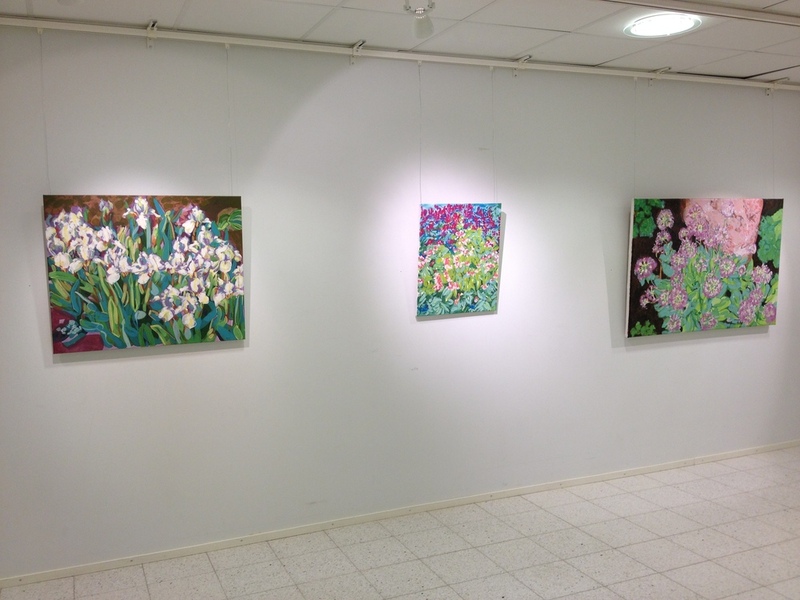 The weather in Northern Finland might be putting on its most bleak, dark and dreary game face, but in Galleria Myötätuuli in Raahe, there is a bit of summer color and warmth. My newest abstracted flora paintings and watercolors are in exhibition for the month of November. The opening party was on the evening of November 1, 2012, with students from the local music school performing a few folk songs and Chief Physician Pirkko Ahokas-Tuohinto from Raahe City Council to inaugurate the exhibition. I want to thank Soili Lankia and Sinikka Pollari (culture operations director and culture supervisor) for their fantastic help and support. This is a wonderfully run city gallery, and I highly recommend it for artists and art lovers. It may be in a small town (and have low ceilings), but the people who run it have a lot of enthusiasm and energy.